Vast majority of tourists in Darjeeling are Bengalis who mostly come from Kolkata and its suburbs. One of the primary considerations of most Bengalis is the food. They can't simply survive without 'Maach-Bhaat' (i.e. fish curry & rice). 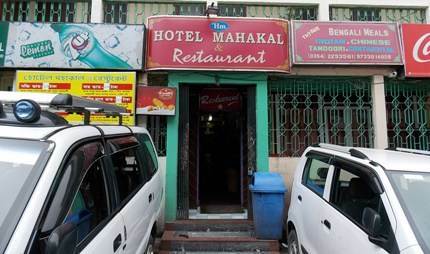 Often they come through tour operators who need to ensure that the hotel where they are put up serves Bengali dishes, otherwise the hotel won't qualify for stay. A good option is to walk down the road below Keventer's (Robertson Road) and you will shortly come across a Bengali restaurant on the left known as Mahakal Restaurant. It's only a minute from Gandhi Road Traffic Police Point. It's a restaurant which is part of a hotel, but the restaurant is the one which is popular out of the two. You will need to enter through rows of cars parked just outside its entrance. A big board outside proudly displays 'Bengali Meals'. The dining area is not big. There are two sections, one on the right of the reception (only two tables with windows facing the road) and another on the left with about six tables. The food served is quite nice and in large portions. You can get fish, chicken, mutton or even egg meals... and all very reasonably priced. 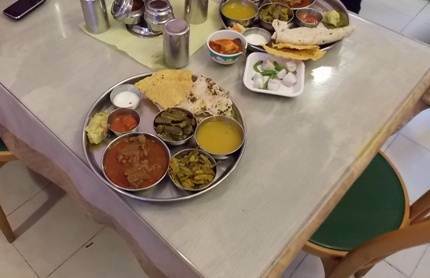 I tried the mutton meal (in September 2014) which comprised of rice or roti, alu sheddo (mashed potato), daal, mutton curry, fried papad, two types of vegetables, curd, pickle, and onions with green chilly. The cost was only Rs. 110/- plus tax and I could not finish it. In fish meals, they usually serve rui maach (rohu fish) along with other accompaniments. During breakfast you will get luchi, begun bhaja etc. They also serve momos, coffee etc. But remember that fish in Darjeeling is likely to be frozen and sometimes can be an old stock (particularly during low season). There are no fresh water lakes in the hill town where fish is cultivated. Frozen fish is brought in from Siliguri and stocked by the restaurants. However, chicken, eggs and lamb are more likely to be fresh. My mutton meal at Mahakal... delicious and huge! There is another restaurant where I like the food too. The in-house restaurant of the Broadway Hotel (located right next to the BSNL telephone office building, off Gandhi road). The restaurant is very simple and unassuming. But if you order in advance (talk to Amit, the owner who is usually there at the reception after 10am), they can make nice Bengali dishes. One of my favorites here is the steaming Khichri (rice with daal preparation) and maach bhaja (fried fish). Amit mentioned that this dish is also a favorite of Anjan Datta, the singer and film maker, who at times comes to the restaurant when he is in Darjeeling. Price range is budget to mid-scale. The in-house restaurant of Chanakya Hotel (located near Gandhi Road Police Point and below Keventers) is often crowded with many Bengalis. They prepare Bengali thalis like Maach bhaat (fish & rice), Mangsho bhaat (mutton & rice), Dim Bhaat (egg & rice) etc). I don't like the ambience here personally. As you enter, the overpowering smell of food in the dining room repels me a bit. But that doesn't stop large numbers of Bengali tourists lining up here for a table. This is probably because of the low price for the food. Visit Chanakya Restaurant to know about how things are there. 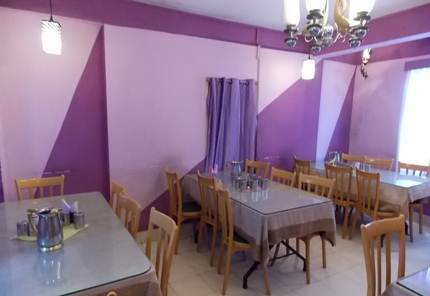 The in-house restaurant of Hotel Meghma also serves Bengali food (price: mid range). It is located on Gandhi Road and close to Hotel Synclairs. Several tour operators accommodate Bengali groups in Hotel Meghma and as a result the restaurant prepares Bengali food. When the hotel gets full during high season, the restaurant also gets quite crowded. Another option on Gandhi Road is Hotel Zodiac located opposite to Bethany School. It's in-house restaurant also serves Bengali food (price: mid range). Address: 27 A/1 Gandhi Road. The Shangri La Restaurant on Nehru Road located close to the Mall also prepares fish curry, rice etc. However this is an upscale restaurant and the preparations here are little rich and have north Indian touch. They may not taste like typical Bengali preparations. But over all quite good. However if you are interested in Nepali food (I like the preparations and some dishes are quite close to Bengali cuisine), try out the Revolver Restaurant located very close to Synclairs hotel on Gandhi Road. I stayed in their hotel once and had a great time. However the best place to try Nepali Thali is at Penang Restaurant, on Laden La Road opposite the State Bank of India Building (walking distance from your hotel). They prepare authentic Nepali thali. Dear Raj, I have recently been to Darjeeling for the first time. I had a blast during my stint. However, one utterly sore point was the food at the Mahakal Restaurant. It was awful - is an understatement. I should have said - it was not eatable. Now, cuisine is dependent on one's own preference, but, when you sale your products as "Authentic Bengali food" while in West Bengal, then I have to expect a class of food that matches the expectations of most of the Bengalis in West Bengal, who experience it daily at their homes.